Using WordPress is so easy. If there is something you need your site to do, whether it is on the front or back end, it is likely that a plugin exists to help you do that. It’s well known that out of the box, WordPress is a completely usable system, but it can certainly use some improvements which developers consider when making useful WordPress project management plugins. These are some of the best add-ons for managing your media library! When websites are loading large, data heavy images, they load more slowly. You might not even be aware that this issue is affecting your load times, but a lagging site causes higher bounce rates and less time on the site, which all affect your overall SE,O not to mention the user’s experience. EWWW Image Optimizer automatically optimizes your images so you know your site is loading as fast as possible. Download the plugin for free to see what it is all about. You can purchase an API key if you want more options. In the backend of a WordPress site, blog posts are listed with some basic information. However, people have been complaining for years that certain important pieces of info are missing. This is one plugin that helps to fix that. It adds a column to show you the featured image for a post, which is a big help on large, content-heavy sites, so you don’t have to spend a long time searching for the exact post you are looking for. Having a lot of large images on your site takes up space and makes more resizing work for you. ImSanity is a plugin that allows you to set a maximum size for any image uploaded to your site, saving you this hassle. It is so amazing that you can even apply your image settings in bulk to pre-existing large images on your site. If you didn’t start with this useful plugin on your site, don’t worry, it’s not too late! Don’t you wish you could organize the pictures in your WP site the way you do on your computer? WP Media Folder allows you to create folders and manage them for better organization and easier searching. Plus, it allows you to drag and drop pictures to upload them. We are so lucky to have plugins that pick up the slack on the most basic WordPress features. Have you encountered the frustration that occurs when you want to rename an image file on WP? The program simply doesn’t allow for that. However, the good folks who have made this plugin have stepped in to save the day. In an easy-to-use interface, Media File Renamer allows you to change the filenames of any images on your site. It solves a straightforward problem in a simple manner. This is probably the most popular media library plugin for WordPress sites. To give you an idea of how many people would vouch for it, there are over 30,000 WP sites using this plugin. It allows you to really fine-tune your WP media libraries. You can create your own shortcodes and easily see where on the site you used a particular image. What’s more is that you can assign categories and tags to images to find and sort them much more easily. If you’ve ever found yourself scouring your media folder trying to find a single image, wondering why there is a single list… this plugin is for you. 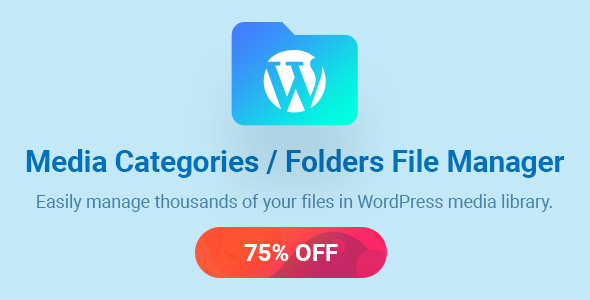 This plugin allows you to create folders and sub folders for all of your uploads making it significantly easier to sort, organize and find your uploaded files.